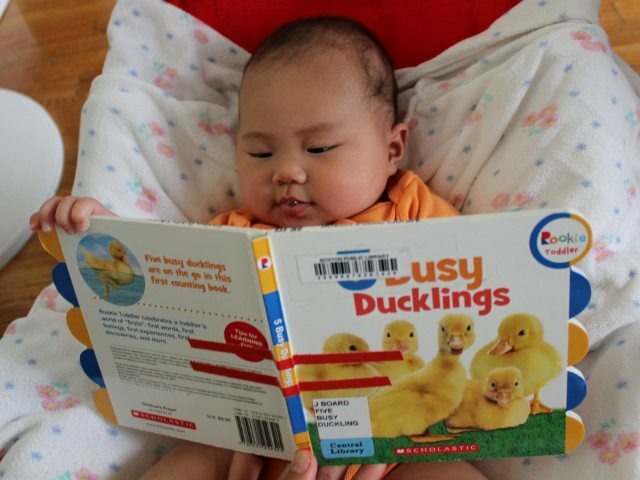 I have recently read many books about ducks to my baby. Since she sees real ducks at Boston Public Garden (and baby sat on fake ducks already), “duck” will probably be the first animal word she says. Five Busy Ducklings by Scholastic is another cute book about ducks, but there is little to separate it from many other good books for babies. Five Busy Ducklings is a counting book that introduces (from one to five) numbers in the context of pictures of little ducks. Each page has a specific number of ducks engaged in a different task. Arya seemed to like the page with four ducklings looking at the pond. I thought the rhyme on the page with five ducks swimming was the best part of the book. The text is simple and easy to read. However the children old enough to read the book themselves will quickly become bored. Younger kids and young babies will enjoy looking at pictures of the ducklings interacting with their environment. The pictures are large enough to attract the attention of babies. A solid white (top) and green (grass at the bottom) background provides adequate contrast. Unfortunately with just ducks on every page there isn’t enough to look at for children to look forward to multiple readings. So while there isn’t anything wrong with Five Busy Ducklings, it simply isn’t as interesting as the best books for babies. I would recommend it to parents who want to introduce their children to pictures of ducks. The images of the ducklings and the mommy duck are the most realistic pictures of ducks I have ever seen in a baby book. Five Busy Ducklings costs (including shipping) $6.95 new and $4 used from Amazon.